The excellent website Inside Schools has identified noteworthy special education programs in New York City Public Schools. Some of these offer preferential enrollment to students in a particular zone and others are open to all students in a district or an entire borough on a first come, first served basis. We've blogged before about Inside Schools and other resources for finding schools, and you may find that article useful as well. A new Museum of Mathematics opens in Manhattan this Saturday, December 15th, right in our neighborhood, at 11 East 26th Street (between Fifth and Madison Avenues). And if that isn't a convenient location for you, the Math Midway program of the Museum offers traveling exhibitions in locations including Florida, California, the Pacific Northwest, and Upstate New York. The Museum is targeted towards fourth through eighth graders, but promises to have information that will also appeal to older visitors. Resources for Children with Special Needs, a New York City nonprofit is once again sponsoring a Camp Fair in January. This year’s event is set for Saturday, January 26, 2013. The fair features camps for children with learning, attention, and behavioral issues as well as camps for children with medical disabilities. 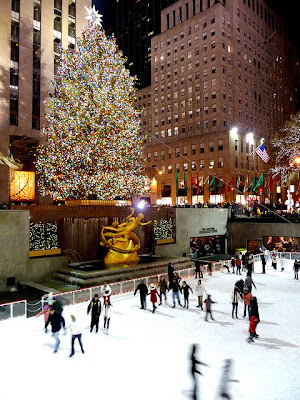 We know lots of families visit New York City during the holidays and we have found a list of family friendly activities in one of the iconic areas of the city -- Rockefeller Center, home to the famous Christmas tree. Besides the tree, you can take an NBC studio tour and visit the Lego store. Don't forget to dress for ice skating! 500 Posts and Still Going Strong! Rewards for Reading: Does It Work?